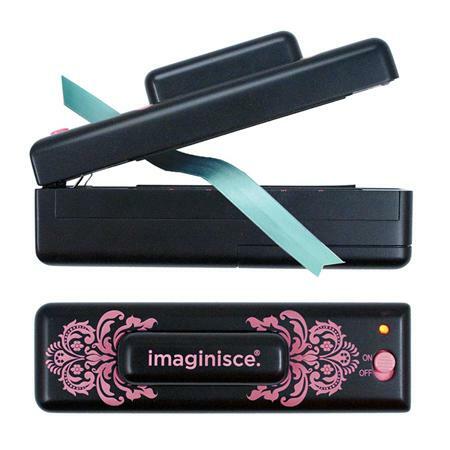 One of the new tools out at CHA is the Imagicut by Imaginisce. The concept is that you can take ribbon and cut it and seal it so it doesn't fray. Being a card maker, I use ribbon all the time and this tool looked to be a great answer to the fraying I encounter all the time. So let's see if it does that. Ease of Use: This was a pretty easy to use tool once you got used to it. It takes some practice to get your ribbon lined up on the grid they have on the tool. One of the things you have to do is practice on how long your ribbon will need. If you push down on the button for too little of time, it won't cut. If you push down too long, it will start to melt. So be sure to practice on some scrap ribbon first. Also, it does not cut and seal any cotton ribbon for obvious reasons. Uh, can we say FIRE! Construction/Durability: The construction is just okay on this. It is super light and feels a little flimsy before you put the batteries in it. The batteries give it weight and so it feels less like a toy. Not sure how long this will last as the aforementioned flimsy feeling. I just recommend keeping it out of the way of little kids. Usefulness: This tool is pretty useful. It does what it says but that's it. It is great for what it is used for and that is the point right? Cost effectiveness: With the price tag of $19.99 I think it is on target for something like this. - I liked the fact that it cuts and seals at the same time. - I liked the cost of it. - I especially like that it is portable so I can take it with me on crops. - I would have liked it better if it had more of a sturdier feel to it, but it is not needed to accomplish the job. - I didn't like the burned smell it emits after you are finished cutting and sealing the ribbon. 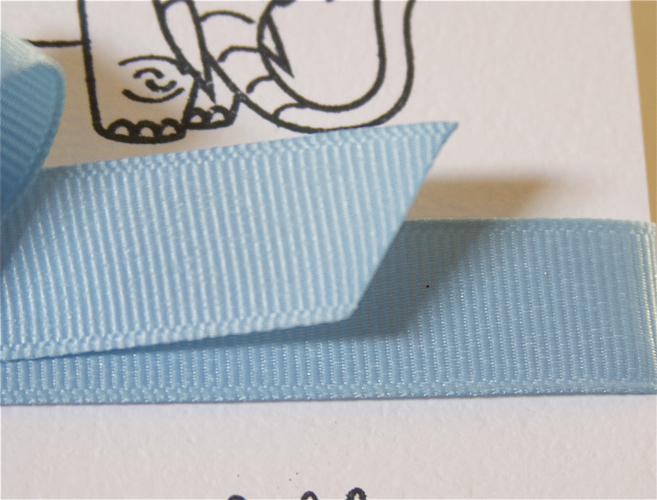 However, this is bound to happen as it is basically melting the edge to seal the ribbon. I really like this product. It is innovative and it works! I love that I can use this quickly and anywhere I want. If you work with ribbon a lot, my advice would be that this is a tool that would find much use in your creative area! What do YOU think? Is this something you would use? Does it even appeal to you? Let us know! Leave a comment by noon EST on Friday to be entered to win one! US Residents only. I think it looks amazing!! I would absolutely LOVE to have one so thanks for the chance to win it! I think this looks super interesting! Could be a useful tool! Thanks for sharing your review! wow! I thought for sure it was "Just another tool" but your edges look SUPERB!! I think it sounds like a great idea! Thanks for a chance to win! When I first saw it on their blog, it just screamed "must have" to me. It is the perfect solution for my ribbon troubles, really I don't know why someone didn't think of it sooner. I saw this on someone's blog at CHA and I thought it's a great tool to have. Thanks for giving a close up of your card/ribbon. The ribbon edges look really clean. I would love to win one of these. A great tool! Another little tool that I need to add to my inventory! Thanks for the chance. A MUST have!!! 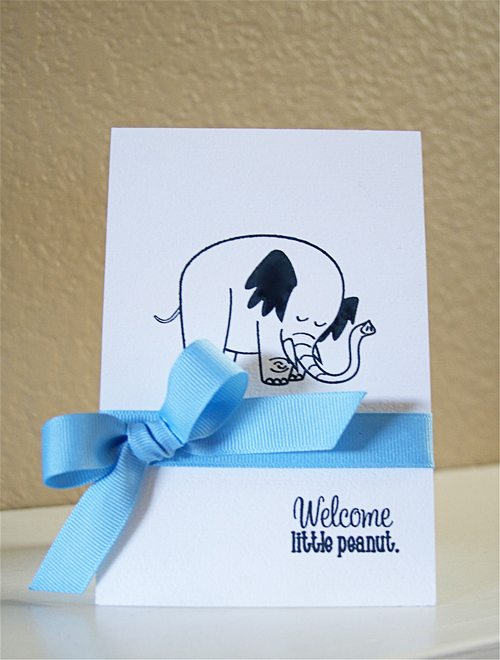 :) I would love to win this as I am a card maker too! When I first saw this neat little tool, I knew it was something I'd like to get. Thanks for the chance to win one. I think this looks like a really cool little tool, but I have a hard time with the $20 price point. It's my guess that I would get one if I could use a coupon for it. Of all the fun stuff released at CHA, I think this tool was the one that sparked my curiosity. Thanks for the review! yes, I would use it and have been very interested in it since watching all the CHA reveals everywhere! I don't use "lots" of ribbon but when I do, I always have to find the correct scissors or I have a mess. This would be great to have for this reason plus it does seal it. Wow, that edge looks so nice and clean and that's why I would possibly get it....ca-ute card by the way! But the price doesn't excite me and I would continue to cut a "v" at the end of my ribbon till I can get it at a lower price. I would love this ... get so frustrated by frayed ribbon ends. I love the idea of cutting and sealing the ribbon! Almost hit "buy" on this the other day, and didn't. I intend on getting it now that I've seen your review. Great result on the ribbon. did you use the feature to make a "banner" style cut? wondered how it worked. anyway....i'd love to win one! thanks! Oh yes! This has been on my list since I saw it after CHA. I would love it. I am a fan of Imaginisce tools so I was really interested in finding someone who has tried this. I am also really picky about how my ribbon looks when on a card. I don't like it wrinkled or frayed. I am excited to hear you liked it!